We ain’t no hiking sissies!!! 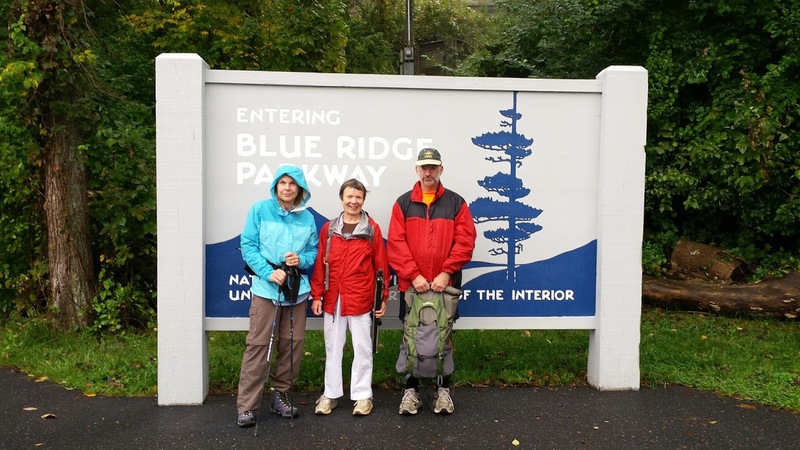 Three veteran hikers Susanna Williams, John Brandt and avid hiker/visitor Jacque Ensign met hike leader Kelly O’Rourke on this rainy day to go hikn’ come what may! We decided to forgo the long drive out to Nicholson Hollow in favor of a closer local hike, so we drove up to Afton, jumped on the AT and walked to the Paul Wolfe shelter. We must have passed 8-10 hikers; some were back packers who had stayed in the shelter the night before. There were still a few people hanging out in the shelter when we got there. Well, just so you all feel bad about your decision to stay home and not join us…..we never saw the first drop of rain! It was beautiful walking through the mist and our visitor felt quite at home since she currently lives in Seattle. We had a great time and were back at the high school by 2:30. Jacque was a member of the club in the early 90’s and hopefully will join us again next week! 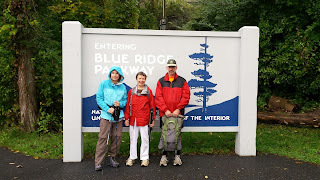 Jana Walters and Kelly O’Rouke joined hike leader Michael Seth on this very nice September day. Michael and Jana came from Harrisonburg and met Kelly who was the only one from Charlottesville to come. The parking lot was full but it was a mystery as to where all the people were since we only saw a few on this long hike and some of them were hiking from the Skyline Drive. We hiked up to Bear Church Rock taking a slight detour along the way to visit the Jones Mountain Cabin. There a few people staying there who gave us a tour. It is a nice quiet spot but with only winter views. We then climbed up Bear Church Rocks where we had lunch. The weather was clear with nice breezes and we had excellent views. After a good rest we hiked along Jones Mountain with it interesting big rocks through a fairly rich forest and eventually to The Sag, supposedly the point in the park furthest from a road. We then hiked back along the scenic Staunton River which had a surprising amount of water for the middle of a drought, enough for many small cascades and pools that would have been tempting had it been hotter. The stream crossings were easy and as was most of the hike back. It was about quarter to six when we got back to our cars. If all the distances on the trail markers are added up we had hiked 13.8 miles. However, according to Kelly’s GPS we hiked 13.5 miles with 3100 feet elevation gain. The general consensus was this is one of the best hikes in the Shenandoah National Park and a new one for Jana and Kelly. Many hands made the load light and also accomplished all the tasks set for the work trip on September 19. Six folks came out to help Marit Anderson on the section of the AT in the Shenandoah National Park that she maintains with Jeff Monroe (Turk Gap to Crimora Lake). Unfortunately Jeff was out on a boy scout camping trip, but he was with us in spirit. John Sinclair had to leave before we reached the trail head. We divided into teams with CJ and David blazing the trees heading north, Katharine and Lee blazing the trees heading south, and Marit and Dave clearing waterbars. After less than two hours the group completed all the tasks, so we headed back to the parking area for lunch and chocolate cookies. With a beautiful, clear day surrounding us we ventured out after the meal for a 2 mile hike up and back to the summit of Turk Mt. The 2400 ft elevation gain made for a short, but invigorating hike. The view of the Shenandoah Valley at the top is always a treat and this day was no exception. Many thanks to these eager volunteers!! 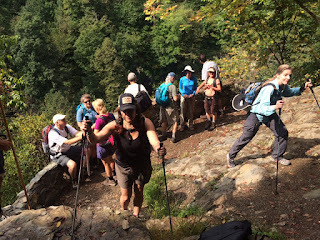 Debra Fisher (who we haven’t seen in a while), Kelly O’Rouke, Samara Khalique, Art Bykonen (first time hiking with us), Andy Willgruber, Iva Gillet, Marian Styles, C.J. Woodburn and David Crowe met Mike Smith and hike leader Michael Seth at the TasteeFreez in Churchville. 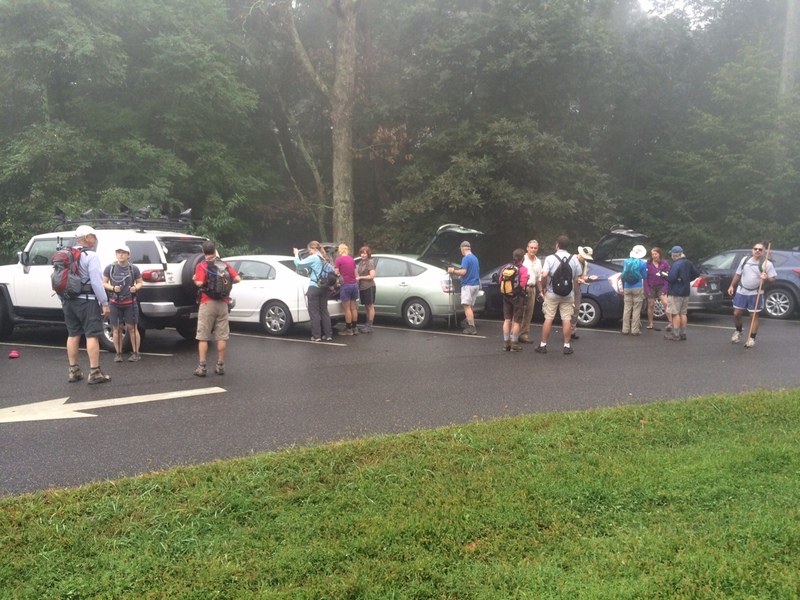 They then drove a maze of back roads to the Wild Oak Parking lot to begin this 9.2 mile loop. We started by hiking up Grindstone Mountain on the Wild Oak Trail. This is a long, steep climb as several noted but we able to get most of the hard part done while it was still morning. We had lunch on a mossy overlook near the top looking to the West. Iva passed out cookies and others offered to share other food (but not the hike leader who violated the chapter’s tradition by not providing treats). Our great concern was for the mountain bikers who have increasingly taken over the trails on Shenandoah Mountain making hiking sometimes scary, dangerous experience as they race down the trails with little warning. Fortunately the only mountain bikers we encountered were speeding down the trail when we were off it having lunch. Soon after lunch we turned on to the four mile Grooms Ridge Trail which despite the best efforts of the trail overseers was somewhat overgrown in sections. Andy and Michael Smith clipped as they hiked, helping hack back some of the overgrowth. In so doing, Michael was able to spot some unique wildflowers with his usual talent for such. We saw many healthy looking chestnuts as well as ghost stands of trees killed a few years ago by the gypsy moths. At the summit, Kelly pulled out her peak finder app so that we could locate all the adjoining Knobs in this area. After resting on the knob in the midway point of the trail to enjoy the great view we began our descent downward with Marian Styles leading the way. We again enjoyed having Samara join us, as she recently moved here for a UVa fellowship. 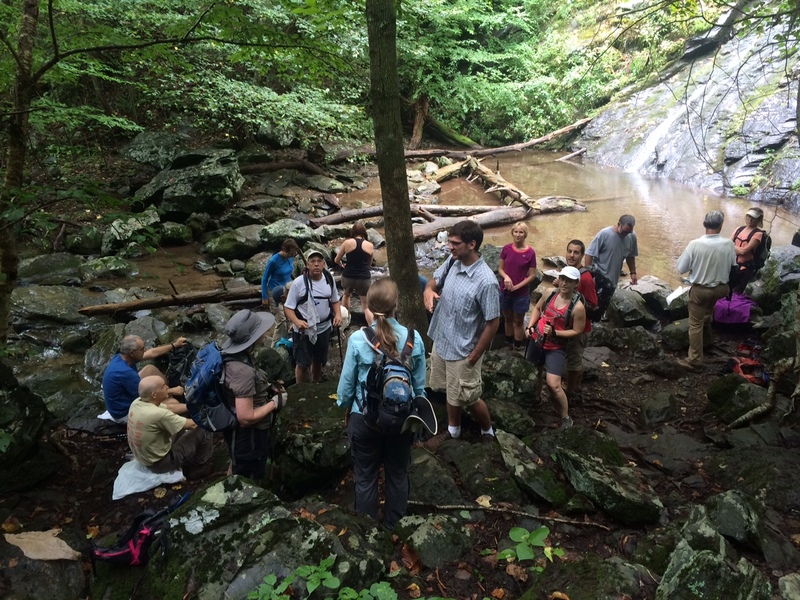 As well, Art traveled from the Richmond area for one of Dr Seth’s infamous hikes. Kelly was worried that the hike would fall short of the 9 miles advertised but a road walk back to the parking lot made in 9.2 miles. Hike Leaders Dan Ralston and Kelly O’Rourke met up with 15 happy hikers and one eager dog to visit the beautiful South River Falls. We had our regular old timers, some regulars we hadn’t seen in a couple of years and 2 shining new faces. We all hiked from the South River Falls picnic area down to an early lunch at the base of the falls. From there we split up the groups into the shorter meandering hikers and the longer mileage hikers. Kelly led the longer mileage hikers (10.2 miles, +2208 gain) back via the Pocosin trail and then South on the AT. Her hikers included John Sinclair, Marian Styles, Jodi Frederiksen, Dave Abdallah, Debra Fisher, John Brandt, David Crowe and CJ Woodburn. We went by the old cemetary, and sat on the steps of an old Episcopal church built in 1902 to eat our "second lunch". We walked by the Pococin cabin, but it was occupied so we did not get an up close visit. Dan led the meanders back via the fire road and then South on the AT. His hikers included Jeanne Densmore, Lee Wenzler, Katherine Maus, James McAdams (a new PATC member), Debbie Webb (a soon to be new PATC member), Lindsay Brown, Dan Funkhooser and Wilson the dog. A wonderful hike had by all on a beautiful holiday weekend. Marit Anderson and Grace Nui coming from south of Lynchburg met Michael Seth at the former Visitors' Center on 211 for this Massanutten Hike. It was a sunny, late summer day. Despite the 90 degree weather below it was much milder on Massanutten, in fact, very pleasant. We started the hike about 9:30 walking along the Wildflower Trail, which had no wildflowers, then joined the Massanutten Trail. A nice feature of this eight mile hike is that almost all the climbing was in the first mile and a half. After finishing our climb we stopped for a snack and a photo shoot at one of the lookouts near the top. Since it wasn't too hazy we had great views to the east looking of the Shenandoah Valley and the Alleghenies from Reddish Knob to Big Schloss. We then followed the Bird Knob Trail (which does not go to Bird Knob despite its name). At 4.6 miles we came upon Emerald Pond. In the not so distant past this spot saw few visitors but recently it has become a popular weekend outing. However, on this weekday we had it to ourselves. We saw no one on the hike today. Marit noted that it would but more accurately labeled Olive Pond, but it definitely is very green. After lunch Marit and Michael went for a swim; Grace posed on the diving rock but declined to join them. The water was cool but not cold unless you swam where the spring come out. Refreshed, we continued hking passing a series of giant anthills. Looping back to the Massanutten Trail and we retraced the first two miles of our hike back to the parking lot.